Species lacks baseline assessment and monitoring data. The species may face threats to mature forest nest sites in riparian areas due to development, altered hydrology, and grazing, but how operational these threats are is uncertain. Thus, the species is most appropriately placed on the Potential Species of Concern list with a state conservation status rank of S3S4 until more information is available. CommentRiparian deciduous forests and woody draws relatively stable within +/-25% since European arrival. CommentNo trend data available due to lack of adequate survey/monitoring effort, but assumed to be relatively stable. ScoreD - Moderate, non-imminent threat. Threat is moderate to severe but not imminent for a significant portion of the population or area. 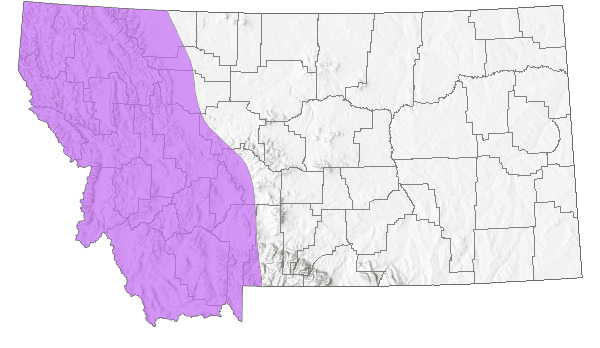 CommentHousing development in riparian areas and altered hydrology and grazing leading to the loss of cottonwood forest regeneration, are the greatest threats to the species in Montana. CommentDeclines in mature forest nest sites will take a long time to recover. CommentA large portion (>20%) of riparian deciduous forests are decadent. CommentThreat is not fully operational now, but some areas have been lost. CommentNarrow Specialist. Uses a broad variety of mature deciduous forests, but rely on relatively large nest cavities. 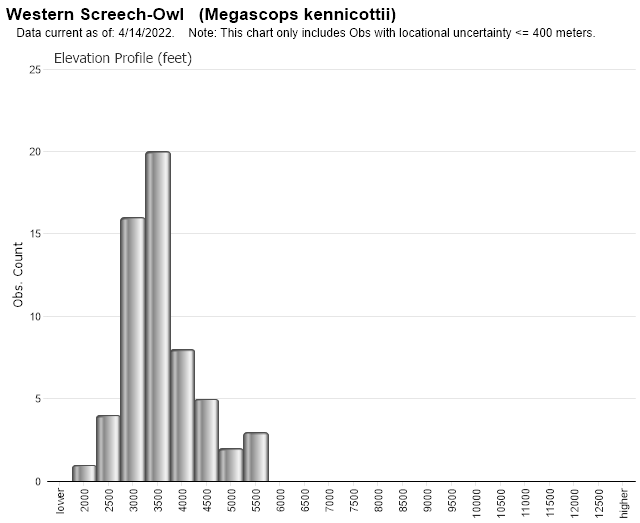 In Western Screech-Owls, tufts are present, eyes are yellow, the bill is black to gray-green or gray-black. The facial disk is gray and surrounded by a black border. Ventrally, they are a heavily marked owl with dark brown horizontal barring and vertical streaking, creating a uniform dark coloration. Dorsally, they are the same as ventrally, but with distinct white spotting on the shoulders. The size is eight to 10 inches and the weight is six to eight ounces. They have two calls. The first call is, "toot, toot, toot toot toot toot" accelerating in tempo, similar to a bouncing ball. The second call is a trill. The Eastern Screech-Owl in Montana has much lighter plumage and has a lighter bill ranging from yellow-white to yellow-green. 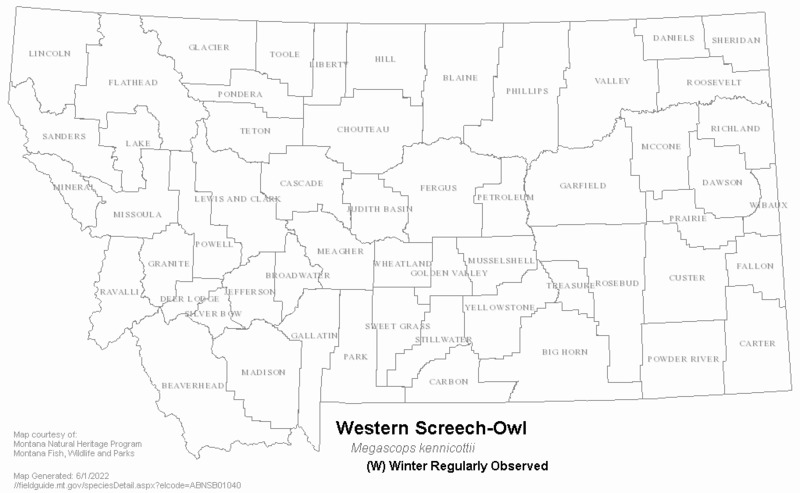 Western Screech-Owls are probably year-round residents. Habitat is primarily cottonwood bottoms, but they may exist along the fringes of coniferous forests where the two habitats overlap. Prey is predominately small mammals and a few birds. Territories are defended throughout the year (Cannings and Angell 2001). 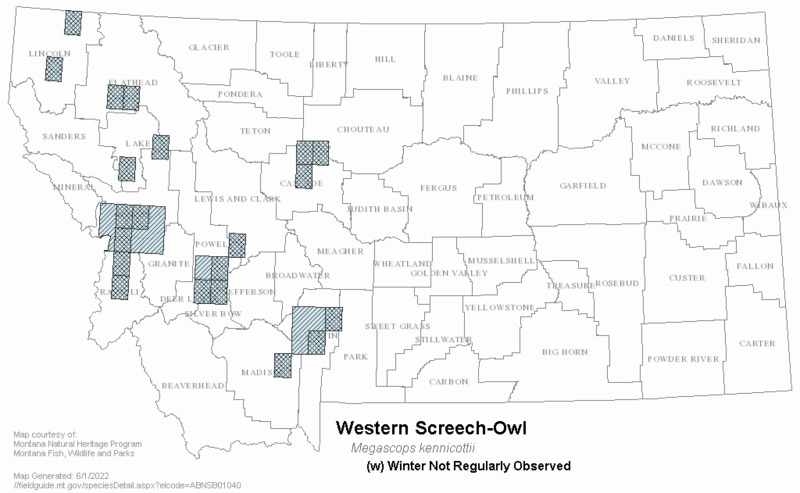 Western Screech-Owls begin breeding in March. Nests are in natural cavities or woodpecker holes. Clutch size is three to seven. Incubation is approximately 29 days. The young fledge at approximately 30 days. Dorn, R.D. and J.L. Dorn. 1994. 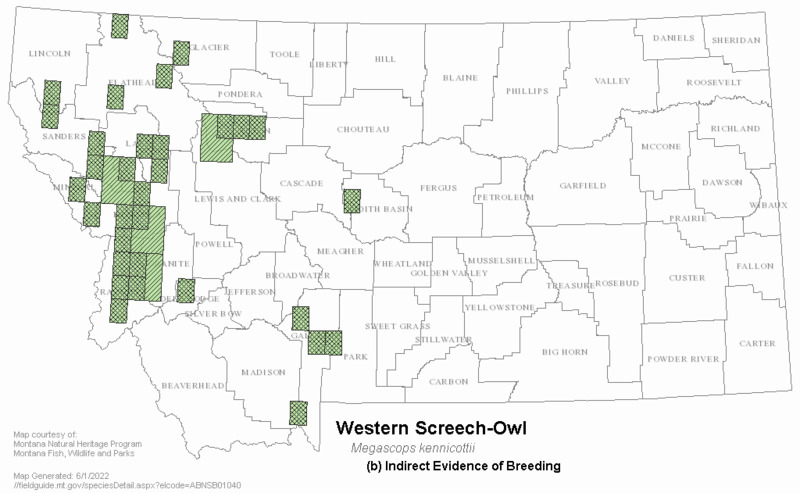 Further data on screech-owl distribution and habitat use in Wyoming. West. Birds 25:35-42. Fitton, S. 1993. 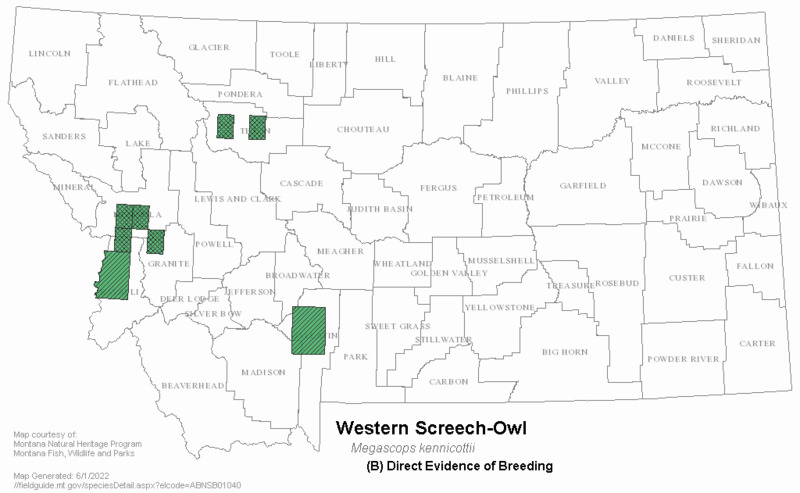 Screech-owl distribution in Wyoming. West. Birds 24:182-188. Holt, D. W., and J. M. Hillis. 1987. 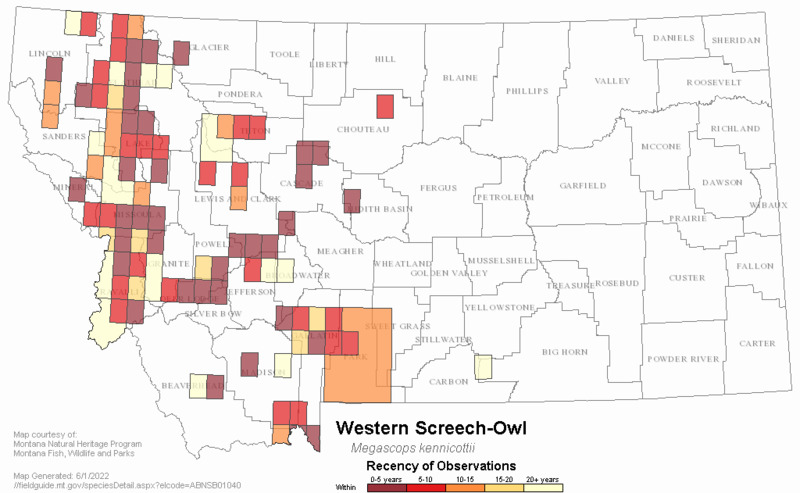 Current status and habitat associations of forest owls in western Montana. Pages 281-288 in Biology and conservation of northern forest owls: Symposium proceedings (R. W. Nero, R. J. Clark, R. J. Knapton, and R. H. Hamre, Eds.). U.S. Forest Service General Technical Report RM-142, Fort Collins, Colorado. 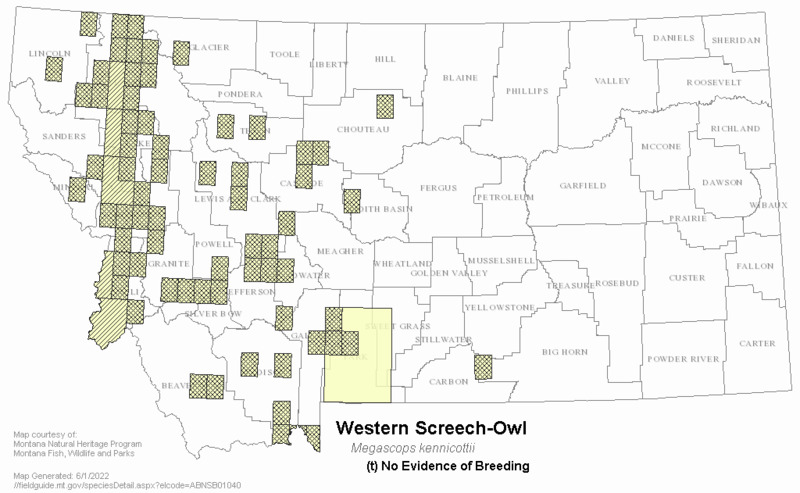 Web Search Engines for Articles on "Western Screech-Owl"